What compels Young to further his studies is exactly this â€“ to learn more about what causes autism, schizophrenia and other disorders characterized by deficits in social engagement. Young recently took two major steps to garner more information from his hamster-sized rodents: convincing the National Institutes of Health to sequence the vole genome within the next two years, a move that will accelerate the discovery of genes contributing to social function; and developing the first transgenic voles, a technology that allows researchers to manipulate individual genes to understand their effect on social bonding and other complex social behaviors. 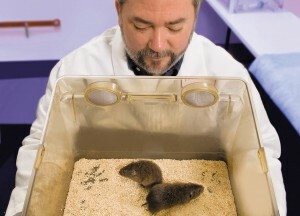 Young believes the vole model could be used to improve social cognition. His next steps are to apply the discoveries made in voles to nonhuman primates, whose brain function is more similar to that of humans.